A refreshing blend of science and creativity, Ekari has experience in environmental research at the community level, and freelance writing for magazines - both fiction and non-fiction (researched) articles. 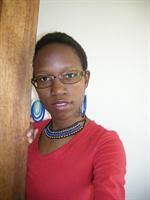 She is a report writer and playwright with the flexibility to adjust her style to suit your project. Open to both freelance projects and permanent job positions. If you want to hire a creative, self-motivated writer/researcher to manage your project, look no further than this driven individual. Ekari has volunteered for UNICEF as a Water, Sanitation and Hygiene (WASH) researcher, working with a partner to carefully collect and analyse quantitative and qualitative data on the hygiene behaviour of rural government school children all across Malawi. On conclusion of the project, she presented a clear summary of the data using Power Point and other MS Office applications, ensuring that the audience absorbed the information. The final 30 page report contributed to the national WASH policy framework in Malawi. Creatively, she has shown to be equally adept. She has worked as an assistant for project FAME (Fashion Malawi Edition), providing creative input, facilitating dialogue both online and off between models, designers and sponsors, and assisting in many tasks such as logging model measurements, disseminating this information, directing photo shoots and seeking companies for sponsorship. Ekari is a freelance writer with her own creative blog, and has been published in Ulendo Magazine which is Air Malawi's official in-flight magazine. She wrote an historical article about the lakeside town of Mangochi, submitting her own photos which were selected for publication as well. She showed independent capability in both finding and researching a story. She is educated up to honours level in Disaster Risk Science, with a certification in ISO 14001 for lead environmental auditor. She is willing to relocate if required for a job. Please feel free to email her to request a cover letter, full CV, copy of her ISO certificate and/or reference letters. [Marketing & Media] Are the recent strikes self-defeating? The unrest is causing conspicuous weakening of the Rand...so salaries go up, but their Rands will be worth less. Is there a more sensible method? Aside from some of the surprisingly heated comments... I totally agree with constant up-skilling. That fragile dream that a degree was enough to stand out from the pack was shattered ages ago. Thank you Mbali, this post helped a great deal. I will write a similar one when I've made my big break!